Subscribers can sign up to receive status notifications using a variety of methods such as email, webhooks and more. Manage these subscribers from the Notifications tab within the Dashboard. 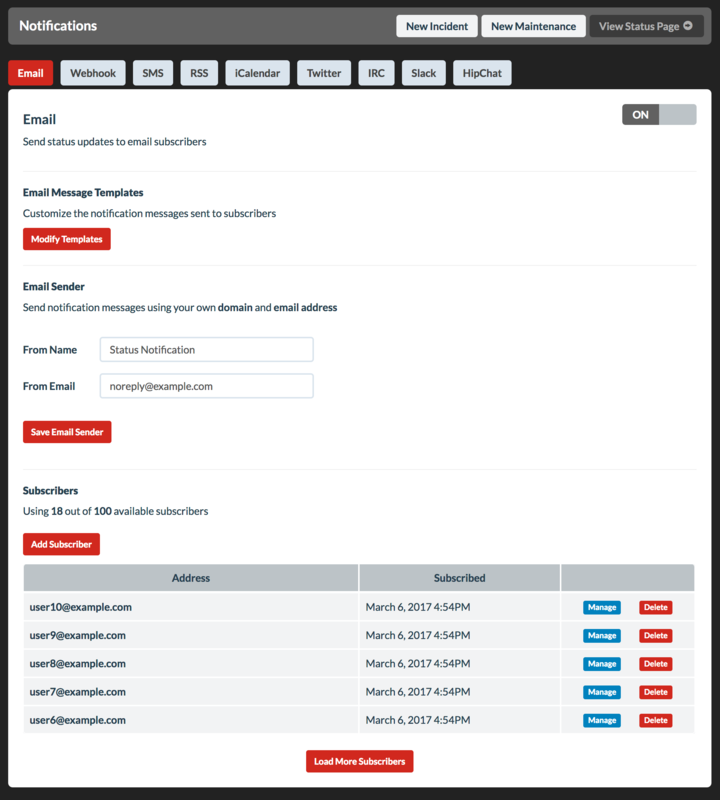 From here, you can manage the granular subscriptions for a subscriber or delete the subscriber. By default anyone can subscribe to receive notifications directly from your public status page. If you’d prefer to retain complete control over your subscriber list, the Subscribe Button can be disabled. Then you can choose to manually add subscribers from the Dashboard or integrate with the Developer API to automatically add subscribers. Learn more about Importing Subscribers. Turn off the Subscribe Button from the Design / Advanced tab within the Dashboard.